The Utah mayor and National Guard major who was killed in Afghanistan last week is a painful reminder on this Veterans Day of the ultimate sacrifice members of the U.S. Armed Forces make to keep our country safe. Brent Taylor, 39, was on his fourth tour of duty when he was shot and killed. He left behind seven children and a shaken community as the war in Afghanistan has dragged on so long that those born on 9/11 are now old enough to enlist. 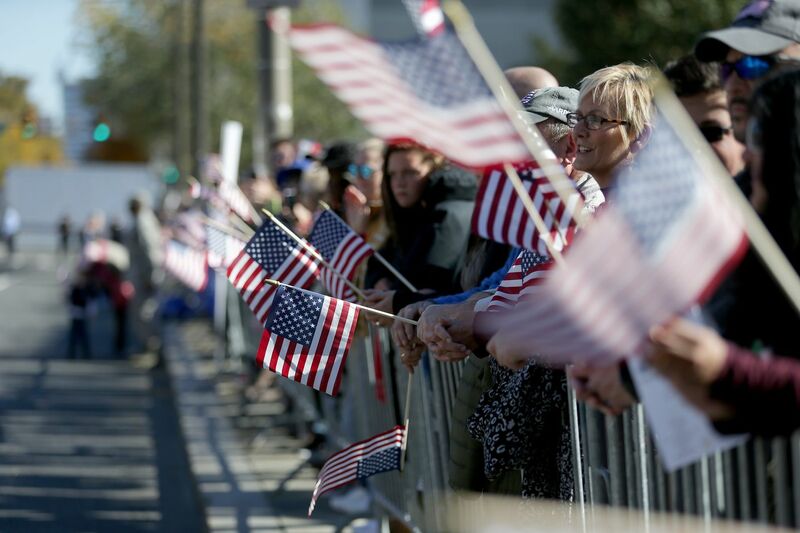 Of the more than 18 million veterans, more than 3.5 million served after Sept. 11, 2001, according to the Census Bureau. While the country makes sure to honor its veterans once a year – thousands attended the Veterans Day parade in Philadelphia last week – the rest of the time many veterans are left to struggle. The problems many veterans confront range from addiction, unemployment, and homelessness to suicide and post-traumatic stress disorder, which has spiked in the last decade. The 28-year-old man who shot and killed 12 people in a California bar last week was a Marine veteran who had several interactions with law enforcement officials in recent years, including a disturbance in April that prompted a mental-health specialist to talk to him. Meanwhile, Veterans Administration hospitals have been plagued with long delays for veterans seeking medical and mental-health care. A 2014 audit found more than 57,000 veterans waiting more than 90 days for an appointment and an additional 63,869 who requested medical care but were not added to a VA waiting list. President Trump made support for veterans a priority, but so far the results are mixed. He created a hotline for veterans to ensure complaints do not fall through the cracks and signed off on a plan to overhaul electronic medical records. The upgrades came with a cost: Trump recently signed the largest budget ever for the Department of Veterans Affairs. Other promises Trump made to veterans have fallen short. Despite the increased attention of problems plaguing the VA, many veterans still face months-long delays just to see a doctor, according to a recent Government Accountability Office report. The agency has also been hobbled by unsteady leadership. Trump's first two choices to head the agency flamed out and acting Secretary Peter O'Rourke came under fire for playing politics before current Secretary Robert Wilkie was confirmed in July. Then came reports in August that the Trump administration aimed to roll back enforcement of the Military Lending Act, which was designed to protect active-duty service members and veterans from getting cheated by predatory lending practices. A Department of Defense study found military members were four times as likely to be targeted by shady lenders. The current troubles at the VA are not new. Only the names and scandals seem to change. But the inefficiency and incompetence seem to remain. Yes, the VA is a complex bureaucracy. But the stakes are high. Veterans have already put their lives on the line; why are we making them do it again and again with a VA that is substandard? Veterans deserve much more than this.